The former president is keeping tabs on his successor in the White House and selectively weighing in. Former President Barack Obama and his team are not ruling out the possibility Obama will challenge President Donald Trump more forcefully in the coming months. Barack Obama and his aides expected to take on President Donald Trump at some point, but they didn’t think it would happen this quickly. Now they’re trying to find the right balance on issues that demand a response, and how to use Obama to deliver the selective pushback. Obama and his team are monitoring what’s happening at the White House, and not ruling out the possibility that Obama will challenge Trump more forcefully in the coming months, according to people who’ve been in contact with the former president. It depends on Trump. It also depends, the people close to the former president said Monday, on whether speaking out would just set him up to have no effect and be dismissed, and result in empowering Trump more, which is a very real worry for them. From his vacation spot in the Caribbean, Obama has been keeping up with news from Washington and the protests around the country. Friends and former aides have been emailing and talking to him. His staff at his post-presidential office, still unpacking its boxes, told him about the reporters who kept asking, even in Trump’s first week as president, whether enough had happened already to meet his threshold to speak up. He decided he finally had to say something about the immigration executive order that’s sparked outrage across the country. But he decided he couldn’t say it himself—not yet, at least. But Obama won’t weigh in on Trump’s firing deputy attorney general Sally Yates for refusing to enforce the executive order that sparked the statement, wary of getting drawn in to every battle. President Donald Trump refused to take a question from CNN correspondent Jim Acosta at a contentious Jan. 11 press conference in New York. The White House has refused to send its spokespeople or surrogates onto CNN shows, effectively icing out the network from on-air administration voices. A CNN reporter, speaking on background, was more blunt: The White House is trying to punish the network and force down its ratings. “They’re trying to cull CNN from the herd,” the reporter said. Administration officials are still answering questions from CNN reporters. But administration officials including White House Press Secretary Sean Spicer and senior counselor Kellyanne Conway haven't appeared on the network's programming in recent weeks. Spicer, speaking at an event at the George Washington University on Monday, denied that CNN was being frozen out, pointing out that he’s answered CNN’s questions in the regular daily briefings. But, he added "I'm not going to sit around and engage with people who have no desire to actually get something right." In the 10 days since the inauguration, Bannon has rapidly amassed power in the West Wing. Says one insider of Steve Bannon: “He’s telling Trump that he can do everything he said he would do on the campaign trail." As protests erupted around the country late Saturday in response to President Donald Trump’s executive order on immigration, many of his key White House staff left for the black-tie Alfalfa Club dinner — but not his top adviser, Steve Bannon, who stayed behind at the White House with the president, according to a senior White House official. In the 10 days since Trump’s inauguration, Bannon — the former head of Breitbart News — has rapidly amassed power in the West Wing, eclipsing chief of staff Reince Priebus, who was among those at the Alfalfa Club event. Along with charting the early direction of the Trump administration, he’s been named to a seat on the National Security Council, giving him a part in the nation’s most sensitive intelligence operations. Bannon and senior presidential adviser Stephen Miller helped lay the political and ideological foundations for Trump’s rise before Trump came on the scene. Breitbart was instrumental in promoting the idea that establishment Republican lawmakers had betrayed American workers on issues like immigration and trade, a theme Trump rode to victory in November. They’ve been responsible for setting an “action plan” for Trump’s first weeks in the White House, developing executive orders and memoranda, and deciding when Trump would sign each new document, according to people familiar with the process. Former President Barack Obama made his first statement since leaving the White House Monday. It is Obama's first statement since leaving the White House. “Citizens exercising their Constitutional right to assemble, organize and have their voices heard by their elected officials is exactly what we expect to see when American values are at stake,” Lewis said. Lewis highlighted Obama’s past comments against a Muslim ban, but spoke about Trump’s executive order only indirectly. “With regard to comparisons to President Obama’s foreign policy decisions, as we’ve heard before, the president fundamentally disagrees with the notion of discriminating against individuals because of their faith or religion,” Lewis said. Donald Trump's first interview as president aired Wednesday night on ABC News, and it was unapologetic, full of baseless claims and entirely Trump. Below is the full ABC transcript with our annotations. To see an annotation, click on the highlighted text. DAVID MUIR: Mr. President, it's an honor to be here at the White House. PRESIDENT TRUMP: Thank you very much, David. PRESIDENT TRUMP: It has periodically hit me. And it is a tremendous magnitude. And where you really see it is when you're talking to the generals about problems in the world. And we do have problems in the world. Big problems. The bigness also hits because the — the size of it. The size. I was with the Ford yesterday. And with General Motors yesterday. The top representatives, great people. And they're gonna do some tremendous work in the United States. They're gonna build plants back in the United States. But when you see the size, even as a businessman, the size of the investment that these big companies are gonna make, it hits you even in that regard. But we're gonna bring jobs back to America, like I promised on the campaign trail. DAVID MUIR: And we're gonna get to it all right here. DAVID MUIR: Mr. President, I want to start — we're five days in. And your campaign promises. I know today you plan on signing the order to build the wall. DAVID MUIR: Are you going to direct U.S. funds to pay for this wall? Will American taxpayers pay for the wall? DAVID MUIR: So, they'll pay us back? PRESIDENT TRUMP: Yeah, absolutely, 100 percent. DAVID MUIR: So, the American taxpayer will pay for the wall at first? 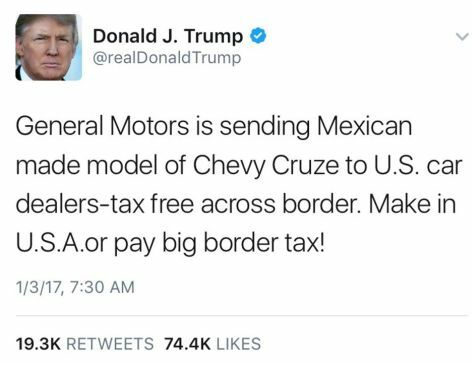 PRESIDENT TRUMP: All it is, is we'll be reimbursed at a later date from whatever transaction we make from Mexico. Now, I could wait a year and I could hold off the wall. But I wanna build the wall. We have to build the wall. We have to stop drugs from pouring in. We have to stop people from just pouring into our country. We have no idea where they're from. And I campaigned on the wall. And it's very important. But that wall will cost us nothing. PRESIDENT TRUMP: David, he has to say that. He has to say that. But I'm just telling you there will be a payment. It will be in a form, perhaps a complicated form. And you have to understand what I'm doing is good for the United States. It's also going to be good for Mexico. We wanna have a very stable, very solid Mexico. Even more solid than it is right now. And they need it also. Lots of things are coming across Mexico that they don't want. I think it's going to be a good thing for both countries. And I think the relationship will be better than ever before. You know, when we had a prisoner in Mexico, as you know, two years ago, that we were trying to get out. And Mexico was not helping us, I will tell you, those days are over. I think we're gonna end up with a much better relationship with Mexico. We will have the wall and in a very serious form Mexico will pay for the wall. PRESIDENT TRUMP: Well, I'd say very simply that they are going to pay for it. I never said they're gonna pay from the start. I said Mexico will pay for the wall. But what I will tell my supporters is, “Would you like me to wait two years or three years before I make this deal?” Because we have to make a deal on NAFTA. We have to make a new trade deal with Mexico because we're getting clobbered. We have a $60-billion trade deficit. So, if you want, I can wait two years and then we can do it nice and easily. I wanna start the wall immediately. Every supporter I have — I have had so many people calling and tweeting and — and writing letters saying they're so happy about it. I wanna start the wall. We will be reimbursed for the wall. DAVID MUIR: When does construction begin? PRESIDENT TRUMP: I would say in months. Yeah, I would say in months. Certainly planning is starting immediately. PRESIDENT TRUMP: We'll be having some really good, really solid plans within a short period of time. DAVID MUIR: When people learn of the news of this wall today there are gonna be a lot of people listening to this. And I wanna ask about undocumented immigrants who are here — in this country. Right now they're protected as so-called dreamers — the children who were brought here, as you know, by their parents. Should they be worried — that they could be deported? And is there anything you can say to assure them right now that they'll be allowed to stay? PRESIDENT TRUMP: They shouldn't be very worried. They are here illegally. They shouldn't be very worried. I do have a big heart. We're going to take care of everybody. We're going to have a very strong border. We're gonna have a very solid border. Where you have great people that are here that have done a good job, they should be far less worried. We'll be coming out with policy on that over the next period of four weeks. DAVID MUIR: But Mr. President, will they be allowed to stay? PRESIDENT TRUMP: I'm gonna tell you over the next four weeks. But I will tell you, we're looking at this, the whole immigration situation, we're looking at it with great heart. Now we have criminals that are here. We have really bad people that are here. Those people have to be worried 'cause they're getting out. We're gonna get them out. We're gonna get 'em out fast. General Kelly is — I've given that as his number one priority. DAVID MUIR: Senator Jeff Sessions, your pick for attorney general, as you know during his confirmation hearing said that ending DACA, this is President Obama's policy protecting the dreamers — that, “Ending it certainly would be constitutional.” That you could end the protection of these dreamers. Is that a possibility? PRESIDENT TRUMP: We're gonna be talking with — attorney general. He will soon be the attorney general. He's done fantastically well. We're all very proud of him. I thought he was treated very, very unfairly. He's a brilliant man and he's a very good man. He'll do a fantastic job. I'll be speaking to him as soon as he's affirmed. DAVID MUIR: So, it's a possibility. PRESIDENT TRUMP: We will be talking to the attorney general. DAVID MUIR: I wanna ask you about something you said this week right here at the White House. You brought in congressional leaders to the White House. You spoke at length about the presidential election with them — telling them that you lost the popular vote because of millions of illegal votes, 3 to 5 million illegal votes. That would be the biggest electoral fraud in American history. Where is the evidence of that? PRESIDENT TRUMP: So, let me tell you first of all, it was so misrepresented. That was supposed to be a confidential meeting. And you weren't supposed to go out and talk to the press as soon as you — but the Democrats viewed it not as a confidential meeting. PRESIDENT TRUMP: … and I mean it. But just so you — it was supposed to be a confidential meeting. They turned it into not a con … Number two, the conversation lasted for about a minute. They made it — somebody said it was, like, 25 percent of the … It wasn't. It was hardly even discussed. I said it. And I said it strongly because what's going on with voter fraud is horrible. That's number one. Number two, I would've won the popular vote if I was campaigning for the popular vote. I would've gone to California where I didn't go at all. I would've gone to New York where I didn't campaign at all. PRESIDENT TRUMP: … you're just asking a question. I would've easily won the popular vote, much easier, in my opinion, than winning the electoral college. I ended up going to 19 different states. I went to the state of Maine four times for one. I needed one. I went to M — I got it, by the way. But it turned out I didn't need it because we ended up winning by a massive amount, 306. I needed 270. We got 306. You and everybody said, “There's no way you get to 270.” I mean, your network said and almost everybody said, “There's no way you can get to …” So, I went to Maine four times. I went to various places. And that's the beauty of the electoral college. With that being said, if you look at voter registration, you look at the dead people that are registered to vote who vote, you look at people that are registered in two states, you look at all of these different things that are happening with registration. You take a look at those registration for — you're gonna s — find — and we're gonna do an investigation on it. DAVID MUIR: But 3 to 5 million illegal votes? PRESIDENT TRUMP: Well, we're gonna find out. But it could very well be that much. Absolutely. PRESIDENT TRUMP: But we're gonna find out. PRESIDENT TRUMP: In fact, I heard one of the other side, they were saying it's not 3 to 5. It's not 3 to 5. I said, “Well, Mr. Trump is talking about registration, tell--" He said, “You know we don't wanna talk about registration.” They don't wanna talk about registration. PRESIDENT TRUMP: Of course, and I want the voting process to be legitimate. DAVID MUIR: … what I'm asking that — when you say in your opinion millions of illegal votes, that is something that is extremely fundamental to our functioning democracy, a fair and free election. PRESIDENT TRUMP: Sure. Sure. Sure. DAVID MUIR: You say you're gonna launch an investigation. PRESIDENT TRUMP: No, it hasn't. Take a look at the Pew reports. PRESIDENT TRUMP: Really? Then why did he write the report? DAVID MUIR: He said no evidence of voter fraud. PRESIDENT TRUMP: Excuse me, then why did he write the report? PRESIDENT TRUMP: According to Pew report, then he's — then he's groveling again. You know, I always talk about the reporters that grovel when they wanna write something that you wanna hear but not necessarily millions of people wanna hear or have to hear. DAVID MUIR: So, you’ve launched an investigation? PRESIDENT TRUMP: We're gonna launch an investigation to find out. And then the next time — and I will say this, of those votes cast, none of 'em come to me. None of 'em come to me. They would all be for the other side. None of 'em come to me. But when you look at the people that are registered: dead, illegal and two states and some cases maybe three states — we have a lot to look into. PRESIDENT TRUMP: There's nothing bigger. There's nothing bigger. PRESIDENT TRUMP: Let me just tell you, you know what's important, millions of people agree with me when I say that if you would’ve looked on one of the other networks and all of the people that were calling in they're saying, “We agree with Mr. Trump. We agree.” They're very smart people. The people that voted for me — lots of people are saying they saw things happen. I heard stories also. But you're not talking about millions. But it's a small little segment. I will tell you, it's a good thing that we're doing because at the end we're gonna have an idea as to what's going on. Now, you're telling me Pew report has all of a sudden changed. But you have other reports and you have other statements. You take a look at the registrations, how many dead people are there? Take a look at the registrations as to the other things that I already presented. DAVID MUIR: … those people who are on the rolls voted, that there are millions of illegal votes? PRESIDENT TRUMP: I didn't say there are millions. But I think there could very well be millions of people. That's right. PRESIDENT TRUMP: David, and I also say this, if I was going for the popular vote I would've won easily. But I would've been in California and New York. I wouldn't have been in Maine. I wouldn't have been in Iowa. I wouldn't have been in Nebraska and all of those states that I had to win in order to win this. I would've been in New York, I would've been in California. I never even went there. DAVID MUIR: … across from me right now. DAVID MUIR: Do you think that your words matter more now? PRESIDENT TRUMP: Yes, very much. DAVID MUIR: Do you think that that talking about millions of illegal votes is dangerous to this country without presenting the evidence? PRESIDENT TRUMP: No, not at all. DAVID MUIR: You don't think it undermines your credibility if there’s no evidence? PRESIDENT TRUMP: No, not at all because they didn't come to me. Believe me. Those were Hillary votes. And if you look at it they all voted for Hillary. They all voted for Hillary. They didn't vote for me. I don't believe I got one. Okay, these are people that voted for Hillary Clinton. And if they didn't vote, it would've been different in the popular. Now, you have to understand I — I focused on those four or five states that I had to win. Maybe she didn't. She should've gone to Michigan. She thought she had it in the bag. She should've gone to Wisconsin, she thought she had it because you're talking about 38 years of, you know, Democrat wins. But they didn't. I went to Michigan, I went to Wisconsin. I went to Pennsylvania all the time. I went to all of the states that are — Florida and North Carolina. That's all I focused on. PRESIDENT TRUMP: No, no. We're looking at it for the next time. No, no, you have to understand, I had a tremendous victory, one of the great victories ever. In terms of counties I think the most ever or just about the most ever. When you look at a map it's all red. Red meaning us, Republicans. One of the greatest victories ever. But, again, I ran for the electoral college. I didn't run for the popular vote. What I'm saying is if there are these problems that many people agree with me that there might be. Look, Barack Obama — if you look back — eight years ago when he first ran — he was running for office in Chicago for we needed Chicago vote. And he was laughing at the system because he knew all of those votes were going to him. You look at Philadelphia, you look at what's going on in Philadelphia. But take a look at the tape of Barack Obama who wrote me, by the way, a very beautiful letter in the drawer of the desk. Very beautiful. And I appreciate it. But look at what he said, it's on tape. Look at what he said about voting in Chicago eight years ago. It's not changed. It hasn't changed, believe me. Chicago, look what's going on in Chicago. It's only gotten worse. But he was smiling and laughing about the vote in Chicago. Now, once he became president he didn't do that. All of a sudden it became this is the foundation of our country. So, here's the point, you have a lot of stuff going on possibly. I say probably. But possibly. We're gonna get to the bottom of it. And then we're gonna make sure it doesn't happen again. If people are registered wrongly, if illegals are registered to vote, which they are, if dead people are registered to vote and voting, which they do. There are some. I don't know how many. We're gonna try finding that out and the other categories that we talk about, double states where they're — registered in two states, we're gonna get to the bottom of it because we have to stop it. Because I agree, so important. But the other side is trying to downplay this. Now, I'll say this — I think that if that didn't happen, first of all, would — would be a great thing if it didn't happen. But I believe it did happen. And I believe a part of the vote would've been much different. PRESIDENT TRUMP: Well, we're gonna find out. PRESIDENT TRUMP: We're gonna find out. And — and, by the way, when I say you're gonna find out. You can never really find, you know, there are gonna be — no matter what numbers we come up with there are gonna be lots of people that did things that we're not going to find out about. But we will find out because we need a better system where that can't happen. DAVID MUIR: Mr. President, I just have one more question on this. And it's — it's bigger picture. You took some heat after your visit to the CIA in front of that hallowed wall, 117 stars — of those lost at the CIA. You talked about other things. But you also talked about crowd size at the inauguration, about the size of your rallies, about covers on Time magazine. And I just wanna ask you when does all of that matter just a little less? When do you let it roll off your back now that you're the president? PRESIDENT TRUMP: Okay, so I'm glad you asked. So, I went to the CIA, my first step. I have great respect for the people in intelligence and CIA. I'm — I don't have a lot of respect for, in particular one of the leaders. But that's okay. But I have a lot of respect for the people in the CIA. That speech was a home run. That speech, if you look at Fox, okay, I'll mention you — we see what Fox said. They said it was one of the great speeches. They showed the people applauding and screaming and — and they were all CIA. There was — somebody was asking Sean — “Well, were they Trump people that were put--" we don't have Trump people. They were CIA people. DAVID MUIR: … in front of that wall? PRESIDENT TRUMP: People loved it. They loved it. They gave me a standing ovation for a long period of time. They never even sat down, most of them, during the speech. There was love in the room. You and other networks covered it very inaccurately. I hate to say this to you and you probably won't put it on but turn on Fox and see how it was covered. And see how people respond to that speech. That speech was a good speech. And you and a couple of other networks tried to downplay that speech. And it was very, very unfortunate that you did. The people of the CIA loved the speech. If I was going to take a vote in that room, there were, like, 300, 350 people, over 1,000 wanted to be there but they couldn't. They were all CIA people. I would say I would've gotten 350 to nothing in that room. That's what the vote would've been. That speech was a big hit, a big success — success. And then I came back and I watched you on television and a couple of others. DAVID MUIR: Not me personally. PRESIDENT TRUMP: And they tried to demean. Excuse me? PRESIDENT TRUMP: Not you personally but your network — and they tried to demean the speech. And I know when things are good or bad. A poll just came out on my inauguration speech which was extraordinary that people loved it. Loved and liked. And it was an extraordinary poll. PRESIDENT TRUMP: No, because you bring it up. PRESIDENT TRUMP: Well, you just brought it up. I didn't bring it up. I didn't wanna — talk about the inauguration speech. But I think I did a very good job and people really liked it. You saw the poll. Just came out this morning. You bring it up. I didn't bring it up. DAVID MUIR: So, polls and crowd size and covers on Time, those still matter now that you're here as president. PRESIDENT TRUMP: Well, you keep bringing it up. I had a massive amount of people here. They were showing pictures that were very unflattering, as unflattering — from certain angles — that were taken early and lots of other things. I'll show you a picture later if you’d like of a massive crowd. In terms of a total audience including television and everything else that you have we had supposedly the biggest crowd in history. The audience watching the show. And I think you would even agree to that. They say I had the biggest crowd in the history of inaugural speeches. I'm honored by that. But I didn't bring it up. You just brought it up. DAVID MUIR: See, I — I'm not interested in the inaugural crowd size. I think the American people can look at images side by side and decide for themselves. I am curious about the first full day here at the White House, choosing to send the press secretary out into the briefing room, summoning reporters to talk about the inaugural crowd size. Does that send a message to the American people that that's — that's more important than some of the very pressing issues? And I've seen crowds before. Big, big crowds. That was some crowd. When I looked at the numbers that happened to come in from all of the various sources, we had the biggest audience in the history of inaugural speeches. I said the men and women that I was talking to who came out and voted will never be forgotten again. Therefore I won't allow you or other people like you to demean that crowd and to demean the people that came to Washington, D.C., from faraway places because they like me. But more importantly they like what I'm saying. PRESIDENT TRUMP: No, I think you’re demeaning by talking the way you're talking. I think you're demeaning. And that's why I think a lot of people turned on you and turned on a lot of other people. And that's why you have a 17 percent approval rating, which is pretty bad. DAVID MUIR: You will send in the feds? What do you mean by that? PRESIDENT TRUMP: It's carnage. You know, in my speech I got tremendous — from certain people the word carnage. It is carnage. It's horrible carnage. This is Afghanistan — is not like what's happening in Chicago. People are being shot left and right. Thousands of people over a period — over a short period of time. PRESIDENT TRUMP: … in the Middle East. DAVID MUIR: … you mentioned federal assistance. There's federal assistance and then there's sending in the feds. I'm just curious would you take action on your own? PRESIDENT TRUMP: I want them to fix the problem. You can't have thousands of people being shot in a city, in a country that I happen to be president of. Maybe it's okay if somebody else is president. I want them to fix the problem. They have a problem that's very easily fixable. They're gonna have to get tougher and stronger and smarter. But they gotta fix the problem. I don't want to have thousands of people shot in a city where essentially I'm the president. I love Chicago. I know Chicago. And Chicago is a great city, can be a great city. DAVID MUIR: And if they’re unable to fix it? PRESIDENT TRUMP: It can't be a great city. Excuse me. It can't be a great city if people are shot walking down the street for a loaf of bread. Can't be a great city. DAVID MUIR: And if they are unable to fix it, that's when you would send in the feds? PRESIDENT TRUMP: But so far they have been unable. It’s been going on for years. And I wasn't president. So, look, when President Obama was there two weeks ago making a speech, very nice speech. Two people were shot and killed during his speech. You can't have that. DAVID MUIR: So, this is an “or else.” This is a warning? PRESIDENT TRUMP: I want them to straighten out the problem. It's a big problem. DAVID MUIR: Let me ask you about a new report that you were poised to lift a ban on so-called CIA black sites of prisons around the world that have been used in the past. Is that true? PRESIDENT TRUMP: Well, I'll be talking about that in about two hours. So, you'll be there and you'll be able to see it for yourself. DAVID MUIR: Are you gonna lift the ban? PRESIDENT TRUMP: You're gonna see in about two hours. DAVID MUIR: The last president, President Obama, said the U.S. does not torture. Will you say that? PRESIDENT TRUMP: Well, I have a general who I have great respect for, General Mattis, who said — I was a little surprised — who said he's not a believer in torture. As you know, Mr. Pompeo was just approved, affirmed by the Senate. He's a fantastic guy, he's gonna be the head of the CIA. And you have somebody fabulous as opposed to the character that just got out who didn't — was not fabulous at all. And he will I think do a great job. And he is — you know, I haven't gone into great detail. But I will tell you I have spoken to others in intelligence. And they are big believers in, as an example, waterboarding. PRESIDENT TRUMP: Because they say it does work. It does work. DAVID MUIR: Mr. President, you told me during one of the debates that you would bring back waterboarding and a hell of a lot worse. PRESIDENT TRUMP: I would do — I wanna keep our country safe. I wanna keep our country safe. DAVID MUIR: What does that mean? PRESIDENT TRUMP: When they're shooting — when they're chopping off the heads of our people and other people, when they're chopping off the heads of people because they happen to be a Christian in the Middle East, when ISIS is doing things that nobody has ever heard of since Medieval times, would I feel strongly about waterboarding? DAVID MUIR: You're now the president. Do you want waterboarding? PRESIDENT TRUMP: I don't want people to chop off the citizens or anybody's heads in the Middle East. Okay? Because they're Christian or Muslim or anything else. I don't want — look, you are old enough to have seen a time that was much different. You never saw heads chopped off until a few years ago. Now they chop 'em off and they put 'em on camera and they send 'em all over the world. So we have that and we're not allowed to do anything. We're not playing on an even field. I will say this, I will rely on Pompeo and Mattis and my group. And if they don't wanna do, that's fine. If they do wanna do, then I will work for that end. I wanna do everything within the bounds of what you're allowed to do legally. But do I feel it works? Absolutely I feel it works. Have I spoken to people at the top levels and people that have seen it work? I haven't seen it work. But I think it works. Have I spoken to people that feel strongly about it? Absolutely. PRESIDENT TRUMP: … no, I wanna — I will rely on General Mattis. And I'm gonna rely on those two people and others. And if they don't wanna do it, it's 100 percent okay with me. Do I think it works? Absolutely. PRESIDENT TRUMP: We're talking about — no it's not the Muslim ban. But it's countries that have tremendous terror. It's countries that we're going to be spelling out in a little while in the same speech. And it's countries that people are going to come in and cause us tremendous problems. Our country has enough problems without allowing people to come in who, in many cases or in some cases, are looking to do tremendous destruction. PRESIDENT TRUMP: … you'll be hearing about it in two hours because I have a whole list. You'll be very thrilled. You're looking at people that come in, in many cases, in some cases with evil intentions. I don't want that. They're ISIS. They're coming under false pretense. I don't want that. I'm gonna be the president of a safe country. We have enough problems. Now I'll absolutely do safe zones in Syria for the people. I think that Europe has made a tremendous mistake by allowing these millions of people to go into Germany and various other countries. And all you have to do is take a look. It's — it's a disaster what's happening over there. I don't want that to happen here. Now with that being said, President Obama and Hillary Clinton have, and Kerry have allowed tens of thousands of people into our country. The FBI is now investigating more people than ever before having to do with terror. They — and it's from the group of people that came in. So look, look, our country has a lot of problems. Believe me. I know what the problems are even better than you do. They're deep problems, they're serious problems. We don't need more. PRESIDENT TRUMP: You're going to see — you're going to see. We're going to have extreme vetting in all cases. And I mean extreme. And we're not letting people in if we think there's even a little chance of some problem. DAVID MUIR: … the world? DAVID MUIR: … exacerbate the problem? PRESIDENT TRUMP: … David, I mean, I know you're a sophisticated guy. The world is a mess. The world is as angry as it gets. What? You think this is gonna cause a little more anger? The world is an angry place. All of this has happened. We went into Iraq. We shouldn't have gone into Iraq. We shouldn't have gotten out the way we got out. DAVID MUIR: You brought up Iraq and something you said that could affect American troops in recent days. You said, “We should've kept the oil but okay maybe we'll have another chance.” What did you mean by that? PRESIDENT TRUMP: Well, we should've kept the oil when we got out. And, you know, it's very interesting, had we taken the oil, you wouldn't have ISIS because they fuel themselves with the oil. That's where they got the money. They got the money from leaving — when we left, we left Iraq, which wasn't a government. It's not a government now. And by the way, and I said something else, if we go in and do this. You have two nations, Iraq and Iran. And they were essentially the same military strength. And they'd fight for decades and decades. They'd fight forever. And they'd keep fighting and it would go — it was just a way of life. We got in, we decapitated one of those nations, Iraq. I said, “Iran is taking over Iraq.” That's essentially what happened. PRESIDENT TRUMP: We should've kept — excuse me. We should've taken the oil. And if we took the oil you wouldn't have ISIS. And we would have had wealth. We have spent right now $6 trillion in the Middle East. And our country is falling apart. PRESIDENT TRUMP: Our roads — excuse me. Our roads, our bridges, our schools, it's falling apart. We have spent as of one month ago $6 trillion in the Middle East. And in our country we can't afford to build a school in Brooklyn or we can't afford to build a school in Los Angeles. And we can't afford to fix up our inner cities. We can't afford to do anything. Look, it's time. It's been our longest war. We've been in there for 15, 16 years. Nobody even knows what the date is because they don't really know when did we start. But it's time. It's time. Okay, and I kept saying to myself, “Gee, why do they have to keep talking about going in?” All right, so now they go in and it is tough because they're giving the enemy all this time to prepare. I don't wanna do a lot of talking on the military. I wanna talk after it's finished, not before it starts. DAVID MUIR: Let me ask you, Mr. President, about another promise involving Obamacare to repeal it. And you told The Washington Post that your plan to replace Obamacare will include insurance for everybody. That sounds an awful lot like universal coverage. PRESIDENT TRUMP: It's going to be — what my plan is is that I wanna take care of everybody. I'm not gonna leave the lower 20 percent that can't afford insurance. Just so you understand people talk about Obamacare. And I told the Republicans this, the best thing we could do is nothing for two years, let it explode. And then we'll go in and we'll do a new plan and — and the Democrats will vote for it. Believe me. Because this year you'll have 150 percent increases. Last year in Arizona 116 percent increase, Minnesota 60 some-odd percent increase. And I told them, except for one problem, I wanna get it fixed. The best thing I could do as the leader of this country — but as wanting to get something approved with support of the Democrats, if I didn't do anything for two years they'd be begging me to do something. But I don't wanna do that. So just so you understand — Obamacare is a disaster. It's too expensive. It's horrible health care. It doesn't cover what you have to cover. It's a disaster. You know it and I know it. And I said to the Republican folks — and they're terrific folks, Mitch and Paul Ryan, I said, “Look, if you go fast — and I'm okay in doing it because it's the right thing to do. We wanna get good coverage at much less cost.” I said, “If you go fast we then own Obamacare. They're gonna put it on us. And Obamacare is a disaster waiting to explode. If you sit back and let it explode it's gonna be much easier.” That's the thing to do. But the right thing to do is to get something done now. PRESIDENT TRUMP: So I wanna make sure that nobody's dying on the streets when I'm president. Nobody's gonna be dying on the streets. We will unleash something that's gonna be terrific. And remember this, before Obamacare you had a lot of people that were very, very happy with their health care. And now those people in many cases don't even have health care. They don't even have anything that's acceptable to them. Remember this, keep your doctor, keep your plan, 100 percent. Remember the $5 billion website? Remember the website fiasco. I mean, you do admit that I think, right? The website fiasco. Obamacare is a disaster. We are going to come up with a new plan ideally not an amended plan because right now if you look at the pages they're this high. We're gonna come up with a new plan that's going to be better health care for more people at a lesser cost. DAVID MUIR: Last question because I know you're gonna show me around the White House. Last question on this. You've seen the estimate that 18 million Americans could lose their health insurance if Obamacare is repealed and there is no replacement. Can you assure those Americans watching this right now that they will not lose their health insurance or end up with anything less? PRESIDENT TRUMP: So nobody ever deducts all the people that have already lost their health insurance that liked it. You had millions of people that liked their health insurance and their health care and their doctor and where they went. You had millions of people that now aren't insured anymore. DAVID MUIR: … you for reassurance. PRESIDENT TRUMP: … here's what I can assure you, we are going to have a better plan, much better health care, much better service treatment, a plan where you can have access to the doctor that you want and the plan that you want. We're gonna have a much better health care plan at much less money. And why not? Obama's a smart guy. So let it all come do because that's what's happening. It's all coming due in '17. We're gonna have an explosion. And to do it right, sit back, let it explode and let the Democrats come begging us to help them because it's on them. But I don't wanna do that. I wanna give great health care at a much lower cost. DAVID MUIR: … with anything less? PRESIDENT TRUMP: … say no one I think no one. Ideally, in the real world, you’re talking about millions of people. Will no one. And then, you know, knowing ABC, you'll have this one person on television saying how they were hurt. Okay. We want no one. We want the answer to be no one. But I will say millions of people will be happy. Right now you have millions and millions and millions of people that are unhappy. It's too expensive and it's no good. And the governor of Minnesota who unfortunately had a very, very sad incident yesterday 'cause he's a very nice guy but — a couple of months ago he said that the Affordable Care Act is no longer affordable. He's a staunch Democrat. Very strong Democrat. He said it's no longer affordable. He made that statement. And Bill Clinton on the campaign trail — and he probably had a bad night that night when he went home — but he said, “Obamacare is crazy. It's crazy.” And you know what, they were both right. DAVID MUIR: Mr. President, thank you. In the past decade, what marketers do to engage customers has changed almost beyond recognition. With the possible exception of information technology, we can’t think of another discipline that has evolved so quickly. Tools and strategies that were cutting-edge just a few years ago are fast becoming obsolete, and new approaches are appearing every day. Yet in most companies the organizational structure of the marketing function hasn’t changed since the practice of brand management emerged, more than 40 years ago. Hidebound hierarchies from another era are still commonplace. Marketers understand that their organizations need an overhaul, and many chief marketing officers are tearing up their org charts. But in our research and our work with hundreds of global marketing organizations, we’ve found that those CMOs are struggling with how to draw the new chart. What does the ideal structure look like? Our answer is that this is the wrong question. A simple blueprint does not exist. Marketing leaders instead must ask, “What values and goals guide our brand strategy, what capabilities drive marketing excellence, and what structures and ways of working will support them?” Structure must follow strategy—not the other way around. Former McDonald’s CMO Larry Light understood that principle when he became the chief brand officer of the InterContinental Hotels Group, where the marketing team was intent on reorganizing its operation. Light quickly focused the team on defining marketing’s purpose, its goals, and a process for achieving them. Once those had been clarified, a rational reorganization could occur. To understand what separates the strategies and structures of superior marketing organizations from the rest, EffectiveBrands (now Millward Brown Vermeer)—in partnership with the Association of National Advertisers, the World Federation of Advertisers, Spencer Stuart, Forbes, MetrixLab, and Adobe—initiated Marketing2020, which to our knowledge is the most comprehensive marketing leadership study ever undertaken. Coauthor Keith Weed, the CMO of Unilever, is the chairman of the initiative’s advisory board. To date the study has included in-depth qualitative interviews with more than 350 CEOs, CMOs, and agency heads, and over a dozen CMO roundtables in cities worldwide. We also conducted online quantitative surveys of 10,000-plus marketers from 92 countries. The surveys encompassed more than 80 questions focusing on marketers’ data analytics capabilities, brand strategy, cross-functional and global interactions, and employee training. We divided the survey respondents into two groups, overperformers and underperformers, on the basis of their companies’ three-year revenue growth relative to their competitors’. We then compared those two groups’ strategies, structures, and capabilities. Some of what we found should come as no surprise: Companies that are sophisticated in their use of data grow faster, for instance. Nevertheless, the research shed new light on the constellation of brand attributes required for superior marketing performance and on the nature of the organizations that achieve it. It’s clear that “marketing” is no longer a discrete entity (and woe to the company whose marketing is still siloed) but now extends throughout the firm, tapping virtually every function. And while the titles, roles, and responsibilities of marketing leaders vary widely among companies and industries, the challenges they face—and what they must do to succeed—are deeply similar. The framework that follows describes the broad traits of high-performing organizations, as well as specific drivers of organizational effectiveness. 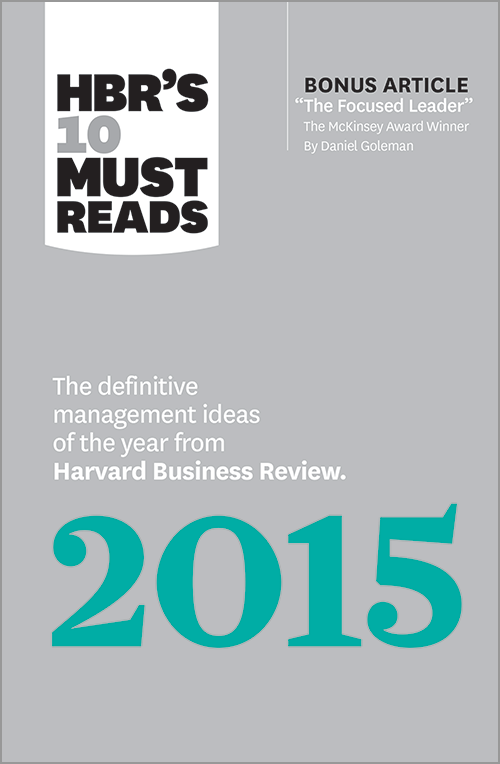 Let’s look first at the shared principles of high performers’ marketing approaches. The Nike+ suite of personal fitness products and services, for instance, combines a deep understanding of what makes athletes tick with troves of data. Nike+ incorporates sensor technologies embedded in running shoes and wearable devices that connect with the web, apps for tablets and smartphones, training programs, and social networks. In addition to tracking running routes and times, Nike+ provides motivational feedback and links users to communities of friends, like-minded athletes, and even coaches. Users receive personalized coaching programs that monitor their progress. An aspiring first-time half-marathon runner, say, and a seasoned runner rebounding from an injury will receive very different coaching. People are rewarded for good performance, can post their accomplishments on social media, and can compare their performance with—and learn from—others in the Nike+ community. Top brands excel at delivering all three manifestations of brand purpose—functional benefits, or the job the customer buys the brand to do (think of the pick-me-up Starbucks coffee provides); emotional benefits, or how it satisfies a customer’s emotional needs (drinking coffee is a social occasion); and societal benefits, such as sustainability (when coffee is sourced through fair trade). Consider the Unilever Sustainable Living Plan, which defines a set of guiding principles for sustainable growth that emphasize improving health, reducing environmental impact, and enhancing livelihoods. The plan lies at the heart of all Unilever’s brand strategies, as well as its employee and operational strategies. In addition to engaging customers and inspiring employees, a powerful and clear brand purpose improves alignment throughout the organization and ensures consistent messaging across touchpoints. 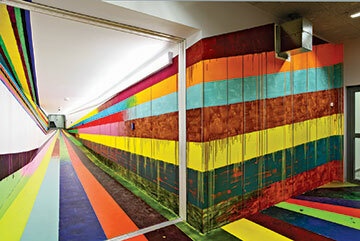 AkzoNobel’s Dulux, one of the world’s leading paint brands, offers a case in point. In 2006, AkzoNobel was operating a heavily decentralized business structured around local markets, with each local business setting its own brand and business goals and developing its own marketing mix. Not surprisingly, the outcome was inconsistent brand positioning and results; Dulux soared in some markets and floundered in others. In 2008, Dulux’s new global brand team pursued a sweeping program to understand how people perceived the brand across markets, paint’s purpose in their lives, and the human truths that inspired people to color their environments. From China, to India, to the UK, to Brazil, a consistent theme emerged: The colors around us powerfully influence how we feel. Dulux wasn’t selling cans of paint; it was selling “tins of optimism.” This new definition of Dulux’s brand purpose led to a marketing campaign, “Let’s Color.” It enlists volunteers, which now include more than 80% of AkzoNobel employees, and donates paint (more than half a million liters so far) to revitalize run-down urban neighborhoods, from the favelas of Rio to the streets of Jodhpur. In addition to aligning the once-decentralized marketing organization, Dulux’s purpose-driven approach has expanded its share in many markets. McCormick, the spices and flavorings firm, emphasizes both depth and breadth in delivering on its promise to “push the art, science, and passion of flavor.” It creates a consistent experience for consumers across numerous physical and digital touchpoints, such as product packaging, branded content like cookbooks, retail stores, and even an interactive service, FlavorPrint, that learns each customer’s taste preferences and makes tailored recipe recommendations. FlavorPrint does for recipes what Netflix has done for movies; its algorithm distills each recipe into a unique flavor profile, which can be matched to a consumer’s taste-preference profile. FlavorPrint can then generate customized e-mails, shopping lists, and recipes optimized for tablets and mobile devices. Marketing has become too important to be left just to the marketers in a company. We say this not to disparage marketers but to underscore how holistic marketing now is. To deliver a seamless experience, one informed by data and imbued with brand purpose, all employees in the company, from store clerks and phone center reps to IT specialists and the marketing team itself, must share a common vision. Our research has identified five drivers of organizational effectiveness. The leaders of high-performing companies connect marketing to the business strategy and to the rest of the organization; inspire their organizations by engaging all levels with the brand purpose; focus their people on a few key priorities; organize agile, cross-functional teams; and build the internal capabilities needed for success. In our work with marketing organizations, we have seen case after case of dysfunctional teamwork, suboptimal collaboration, and lack of shared purpose and trust. Despite cultural and geographic obstacles, our high-performing marketers avoid such breakdowns for the most part. Their leaders excel at linking their departments to general management and other functions. They create a tight relationship with the CEO, making certain that marketing goals support company goals; bridge organizational silos by integrating marketing and other disciplines; and ensure that global, regional, and local marketing teams work interdependently. Marketing historically has marched to its own drummer, at best unevenly supporting strategy handed down from headquarters and, more commonly, pursuing brand or marketing goals (such as growing brand equity) that were not directly related to the overall business strategy. Today high-performing marketing leaders don’t just align their department’s activities with company strategy; they actively engage in creating it. From 2006 to 2013, our surveys show, marketing’s influence on strategy development increased by 20 percentage points. And when marketing demonstrates that it is fighting for the same business objectives as its peers, trust and communication strengthen across all functions and, as we shall see, enable the collaboration required for high performance. Another way companies foster connections is by putting marketing and other functions under a single leader. Motorola’s Eduardo Conrado is the senior VP of both marketing and IT. A year after Antonio Lucio was appointed CMO of Visa, he was invited to also lead HR and tighten the alignment between the company’s strategy and how employees were recruited, developed, retained, and rewarded. Coauthor Keith Weed leads communications and sustainability, as well as marketing, at Unilever. And Herschend Family Entertainment, owner of the Harlem Globetrotters and various theme parks, has recently expanded CMO Eric Lent’s role to chief marketing and consumer technology officer. Marketing has become too important to be left just to the marketers. All employees, from store clerks to IT specialists, must be engaged in it. Inspiration is one of the most underused drivers of effective marketing—and one of the most powerful. Our research shows that high-performing marketers are more likely to engage customers and employees with their brand purpose—and that employees in those organizations are more likely to express pride in the brand. Inspiration strengthens commitment, of course, but when it’s rooted in a respected brand purpose, all employees will be motivated by the same mission. This enhances collaboration and, as more and more employees come into contact with customers, also helps ensure consistent customer experiences. The payoff is that everyone in the company becomes a de facto member of the marketing team. The key to inspiring the organization is to do internally what marketing does best externally: create irresistible messages and programs that get everyone on board. At Dulux, that involved handing paint and brushes to thousands of employees and setting them loose on neighborhoods around the world. Unilever’s leadership conducts a quarterly live broadcast with most of the company’s 6,500 marketers to celebrate best brand practices and introduce new tools. In addition, Unilever holds a series of globally coordinated and locally delivered internal and external communications events, called Big Moments, to engage employees and opinion leaders companywide directly with the broader purpose of making sustainable living commonplace. Research shows this has led to a significant increase in employee commitment. Nike has a marketing staffer whose sole job is to tell the original Nike story to all new employees. Inspiration is so important that many companies, Unilever among them, have begun measuring employees’ brand engagement as a key performance indicator. Google does this by assessing employees’ “Googliness” in performance appraisals to determine how fully people embrace the company’s culture and purpose. And Zappos famously offers new hires $3,000 to leave after four weeks, effectively cutting loose anyone who is not inspired by the company’s obsessive customer focus. When we asked eight global marketing executives in one organization to list their top five marketing objectives, only two goals made it onto everyone’s list. The remainder was a motley assortment of personal or local objectives. Such misalignment, our data show, increases the farther teams are from an organization’s center of power. With marketing activities ever more dispersed across global companies, that risk must be carefully managed. By a wide margin, respondents in overperforming companies agreed with the statements “Local marketing understands the global strategy” and “Global marketing understands the local marketing reality.” Winning companies were more likely to measure brands’ success against key performance indicators such as revenue growth and profit and to tie incentives at the local level directly to those KPIs. Ironically, almost all companies were meticulous in planning and executing consumer communication campaigns but failed to devote the same care to internal communications about strategy. That’s a dangerous oversight. Marc Schroeder, the global marketing head for PepsiCo’s Quaker brand, understood the need for internal cohesiveness when he led a cross-regional “marketing council” to develop and communicate the brand’s first global growth strategy. The council defined a purposeful positioning, nailed down the brand’s global objectives, set a prioritized growth agenda, created clear lines of accountability and incentives, and adopted a performance dashboard that tracked industry measures such as market share and revenue growth. The council communicated the strategy through regional and local team meetings, including those with agencies and retail customers worldwide, and hosted a first-ever global brand stewardship event to educate colleagues. As a result of those efforts, all Quaker marketing plans are now explicitly linked to one overall strategy. Our research consistently shows that organizational structure, roles, and processes are among the toughest leadership challenges—and that the need for clarity about them is consistently underestimated or even ignored. We have helped design dozens of marketing organizations. Typically we enter the scene after a traditional business consultancy has done preliminary strategy, cost, and head-count analyses, and our role is to work with the CMO to create and implement a new structure, operating model, and capability-building program. Though we believe there is no ideal organizational blueprint, our experience does suggest a set of operational and design principles that any organization can apply. Today marketing organizations must leverage global scale but also be nimble, able to plan and execute in a matter of weeks or a few months—and, increasingly, instantaneously. Oreo famously took to Twitter during the blackout at the 2013 Super Bowl, reminding consumers, “You can still dunk in the dark,” making the brand a trending topic during one of the world’s biggest sporting events. That the tweet was designed and approved in minutes was no accident; Oreo deliberately organized and empowered its marketing team for the occasion, bringing agency and brand teams together in a “mission control” room and authorizing them to engage with their audience in real time. Complex matrixed organizational structures—like those captured in traditional, rigid “Christmas tree” org charts—are giving way to networked organizations characterized by flexible roles, fluid responsibilities, and more-relaxed sign-off processes designed for speed. The new structures allow leaders to tap talent as needed from across the organization and assemble teams for specific, often short-term, marketing initiatives. The teams may form, execute, and disband in a matter of weeks or months, depending on the task. As companies expand internationally, they inevitably reorganize to better balance the benefits of global scale with the need for local relevance. Our research shows that, as a result, the vast majority of brands are led much more centrally today than they were a few years ago. Companies are removing middle, often regional, layers and creating specialized “centers of excellence” that guide strategy and share best practices while drawing on needed resources wherever, and at whatever level, they exist in the organization. As companies pursue this approach, roles and processes need to be adapted. Coca-Cola, Unilever, and Shiseido have set up dedicated marketing academies to create a single marketing language and approach. Marketing organizations traditionally have been populated by generalists, but particularly with the rise of social and digital marketing, a profusion of new specialist roles—such as digital privacy analysts and native-content editors—are emerging. We have found it useful to categorize marketing roles not by title (as the variety seems infinite) but as belonging to one of three broad types: “think” marketers, who apply analytic capabilities to tasks like data mining, media-mix modeling, and ROI optimization; “do” marketers, who develop content and design and lead production; and “feel” marketers, who focus on consumer interaction and engagement in roles from customer service to social media and online communities. Companies are using this model to create task forces for a range of marketing programs, from integrating online and physical retail experiences to introducing new products. When Unilever launched Project Sunlight—a consumer-engagement program connected with its sustainable-living initiative—the team drew talent from seven expertise areas. The international cable company Liberty Global uses task forces to optimize the customer experience at key engagement points—such as when customers receive a bill. These teams are led by managers from a variety of marketing and nonmarketing functions, have different durations, and draw from each of the three talent pools in different measure. As we have shown, the most effective marketers lead by connecting, inspiring, focusing, and organizing for agility. But none of those activities can be fully accomplished, or sustained, without the continual building of capabilities. Our research shows pronounced differences in training between high- and low-performing companies, in terms of both quantity and quality. At a minimum the marketing staff needs expertise in traditional marketing and communications functions—market research, competitive intelligence, media planning, and so forth. But we’ve seen that sometimes even those basic capabilities are lacking. Courses to onboard new staff and teach targeted skills are just the price of entry. The best marketing organizations, including those at Coca-Cola, Unilever, and the Japanese beauty company Shiseido, have invested in dedicated internal marketing academies to create a single marketing language and way of doing marketing. Senior managers across the company can benefit from programs for sharing expertise on consumer habits, competitor strategy, and retail dynamics. Virgin, Starbucks, and other corporations have created intensive “immersion” programs for this purpose. Executives at the director level can profit from advanced courses that focus on strategic considerations such as portfolio management and partnering. We find that senior leaders often gain a lot from digital and social media training, as they’re frequently less well versed in those areas than their junior colleagues are. Appreciating this, companies including Unilever and Diageo have taken their senior leaders to Facebook for training. We’ve collaborated with partners at Google, MSN, and AOL to develop similar programs, including “reverse mentoring,” which pairs very senior managers with younger staffers. Even the CMO can benefit from continued, targeted training. Visa’s Antonio Lucio, for instance, hired a digital native to teach him about social media and monitor his progress. Underperforming marketers, on the other hand, underinvest in training. Their employees receive just over half a day of training a year, on average, while overperformers give people nearly two full days of tailored, practical training by external experts. At first blush, the Marketing2020 study reveals what you might expect: Marketers must leverage customer insight, imbue their brands with a brand purpose, and deliver a rich customer experience. They must connect, inspire, focus, organize, and build, as detailed here. The finding that’s striking—and should serve as both a warning and a call to arms—is that most organizations haven’t been able to put all those pieces together. Our data show that only half of even high-performing organizations excel on some of these capabilities. But that shouldn’t be discouraging; rather, it illuminates where there’s work to do. Regardless of how marketing delivers its messages in the future, the fundamental human motivations that marketers must satisfy won’t change. The challenge now is to create organizations that can truly speak to those needs. Republican lawmakers attending the party’s annual retreat say they and President Trump need to get on the same page to take advantage of the GOP’s control of Washington for the first time in more than a decade. A rocky first week in which Trump became embroiled in controversies over inauguration crowd size and voter fraud has Republicans calling for better coordination between the Trump administration and Congress. Senate Republican Conference Chairman John Thune (S.D. ), who’s in charge of messaging for the Senate conference, said there’s substantial room for improvement. “This is obviously a transition that’s underway here. I expect you’ll see probably better coordination over time,” he told reporters. Republicans hope their retreat will serve as an opportunity to move forward together on repealing ObamaCare and enacting tax reform — issues on which there are some divisions among GOP lawmakers. Speaker Paul Ryan (R-Wis.) on Wednesday laid out a detailed timeline for congressional action that calls for House committees to begin marking up legislation to repeal ObamaCare to ready it for action on the House floor by late February or early March. Also on the agenda is passing a second budget resolution in the spring to pave the way for passage of a tax reform package — which could move through the Senate with only 51 votes under budget reconciliation rules. But those issues were largely overshadowed on Wednesday, as Trump became the talk of the retreat with his call for an extensive investigation of alleged electoral fraud and a draft order authorizing the CIA to reopen so-called black sites in foreign countries. Republicans who spoke to reporters repeatedly signaled their unease with those subjects. “I’d advise him and his team to stay on message, which is jobs, jobs, jobs,” Rep. Adam Kinzinger (R-Ill.) said at the media center near Loews Philadelphia Hotel in City Center, where House and Senate Republicans are gathering to rally around a 200-day game plan. “When you argue over crowd size, when you argue over voter fraud, things like that, you’re taking your eye off the message and I think harming your ability to unify Republicans in the country,” he said. Thune, asked about Trump’s call for an investigation of massive voter fraud in the presidential election, declared that contest “history” and said he hadn’t seen evidence of voter fraud. Republicans did get down to some business behind closed doors. Rep. Diane Black (R-Tenn.), the interim House Budget Committee chairwoman who briefed reporters on Ryan’s message, said the repeal package will include some reforms to replace ObamaCare. But she cautioned that she and her colleagues are limited in what they can add due to the Senate’s arcane procedural rules. Language incentivizing the creation of health savings accounts is a likely candidate for inclusion, she said. Once passed by the House the legislation will go to the Senate, where Majority Leader Mitch McConnell (R-Ky.) hopes to pass it with a simple majority vote under special budgetary rules. The goal is to put tax reform on Trump’s desk before the August recess, according to Rep. Chris Collins (R-N.Y.), one of the president’s most loyal backers. Another top priority in the first 200 days is to start construction of a wall along the U.S.-Mexico border, a centerpiece of Trump’s 2016 campaign platform. Trump signed an executive order on Wednesday that would jumpstart construction, which he insisted would begin in months. The wall is another issue where it is not clear if Trump and Republican lawmakers are in agreement. Ryan told colleagues that he expects to move a supplemental appropriations bill to come to the House floor later this year but offered no details on how to offset the wall’s cost or whether Mexico would be pressured to pay for it, as Trump has promised. Infrastructure is another topic of discord. One of Trump’s top campaign pledges, it initially had not been part of Ryan’s 200-day plan. But Trump personally asked Ryan to include it, sources said. Ryan said the infrastructure bill will include incentives for private investment, but he did not offer a price tag, as many Republicans are worried that Trump’s preference for a $1 trillion investment could swell the deficit. Though Trump talked frequently during the campaign about his desire to dramatically improve the nation’s infrastructure, GOP sources on Wednesday said the issue may get pushed into the fall as leaders focus on healthcare and tax reform. GOP leaders are already preparing colleagues for a tough vote to raise the debt ceiling as soon as March. Deficit concerns are looming as a major source of friction between the administration and Congress, as many Republican lawmakers are worried about what impact infrastructure spending and building a border wall will have on the deficit. Thune’s message is that Republicans will get on the same page regardless of all the political noise. One of the more interesting developments that emerged during these past few months is the phenomena of brands facing direct criticism from then President-elect Donald Trump. The frequency and unpredictability of these criticisms has put brands on notice. From questioning the decision to move manufacturing to Mexico, as in the case of Carrier or Ford, or of the estimated cost of Air Force One, as with Boeing. Any brand facing criticism from the new president, along with enduring the accompanying media coverage subjects brands to deep and potentially threatening scrutiny. Like many things associated with the recent election, this is totally new in the political/marketing universe. For the first time, a soon to be sitting president was using his position to publicly chastise a company and brand by name. Though there is no direct precedent it should be noted that presidents have never been totally silent in matters that effect marketing and commerce. For example in 1952, Harry Truman attempted a seizure of the steel industry in the face of a strike. Ten years later, President Kennedy was at odds publicly with the steel industry over pricing. In 1981, Ronald Reagan fired 11,000 striking air traffic controllers for refusing to return to work. In 2009, President Obama attempted to re-invent the healthcare industry with the Affordable Care Act and jump-start the entire green industry in the U.S. In each of these cases, the power of the presidency was brought to bear to settle an issue in the marketplace, or in the case of Obama, rebuild or reinvigorate a marketplace. But in these examples and others, brands weren’t singled out as they are now. Had Twitter been around in 1962, would Kennedy have called out U.S. Steel directly for price gouging? We’ll never know. What we do know is the power of social media (in this case Twitter) wielded directly and personally by a President on a mission to “make America great again” has been quite effective. United Technologies (Carrier), Boeing, Lockheed Martin, Ford, GM, Fiat Chrysler and Toyota, have all had their turn. The news media amplifies the message beyond the President’s 20.3 million followers and CEOs squirm. In every case a negative tweet from @realDonaldTrump has delivered a blow to the brand in stock valuation loss. Stanley is one company that seems to be getting the message. This from their CEO John Lundgren: “It’s going to be advisable to have more manufacturing in the U.S.” Our observation: If your brand is on the Fortune 500, rightly or wrongly your brand could be next. That is why, in assessing your brand’s potential threats as part of a SWOT analysis or other situation analysis, you consider heightened public scrutiny for your business plans and policies as part of that matrix. A Wall Street Journal op-ed recently complained that the new president should allow CEO’s to chart the destiny of the businesses that they know better. While that may be true, the new reality may very well become the new normal for high-profile brands. It is, in fact, a new crisis management scenario that these brands must prepare for. While the combination of presidential administration scrutiny, public criticism and direct threats are a unique development for high-profile brands, threats in the marketplace are not. Essentially, the tweets from @realDonaldTrump can call into question the trustworthiness of the brand to have the country’s best interests at heart. This is much like a consumer group questioning product safety claims or a company’s environmental policy being deemed “green wash.” The difference is, of course, it’s coming from the “highest office in the land” and by virtue of that, it’s news that is capable of threatening the trust consumers have with your brand. The trust issue at the top of this list of brand threats and how to counter them where Mark DiSomma points out: “… the range of behaviors that consumers find unacceptable has broadened to include not just misleading messaging but also the gamut of wider business and ethical issues.” I would add it is the “wider business issues” (relocating manufacturing outside the U.S. or bids that are perceived to be high) and “ethical issues” (the resulting job loss among the brand’s own consumers or unreasonable profits) that a targeted Trump-tweet raises on the basis of trust—or lack there of. Damage control from crisis management techniques aside, how do brands counter this potential threat without necessarily acquiescing, as in the case of Stanley or others? Our advice? If things are happening that you wouldn’t want people to know about, beyond commercial sensitivity, that’s a trust issue waiting to happen. Address it, before buyers address you about it and certainly before the President tweets about it. Threats to your brand will emerge. It’s inevitable. Some you can anticipate and some you can’t. The best way to handle being the target of a disparaging tweet, presidential or otherwise, is to have a plan on how you will take a stand, be transparent, and trustworthy. On Tuesday, six different reporters pressed Spicer on the issue over the course of the briefing. Asked if the White House is going to investigate the alleged voter fraud, Spicer initially suggested that it would not (“No, I think he won very handily with 306 electoral votes, 33 states. He's very comfortable with his win,” he said), but pressed on it again later, he said “maybe we will” but did not make any promises. “We'll see where we go from here,” Spicer said. Since Trump revived his claim of voter fraud on Monday, some Republicans have come out to push back on it. Numerous fact checks have debunked the president's repeated claim of voter fraud that Trump says cost him the popular vote. White House Press Secretary Sean Spicer on Tuesday defended President Donald Trump for continuing to claim that millions of people voted illegally in the November election, despite numerous fact checks and other studies that have debunked the theory. According to independent fact-checkers and Republicans including House Speaker Paul Ryan, there is not evidence of widespread voter fraud in the November presidential race, when Trump won an Electoral College majority but lost the popular vote by almost 3 million. Trump first raised in November on Twitter the unsubstantiated claim that he lost the popular vote because millions of undocumented immigrants voted for Hillary Clinton. He repeated that theory in a closed-door meeting with Congressional leaders on Monday. After referencing unnamed evidence on Tuesday, reporters pressed Spicer to specify on what studies Trump has based his belief of voter fraud. Spicer cited a Pew Research study, but its author, David Becker, has previously denied that the report backs up Trump’s claim. “We found millions of out of date registration records due to people moving or dying, but found no evidence that voter fraud resulted,” Becker tweeted on Nov. 28. 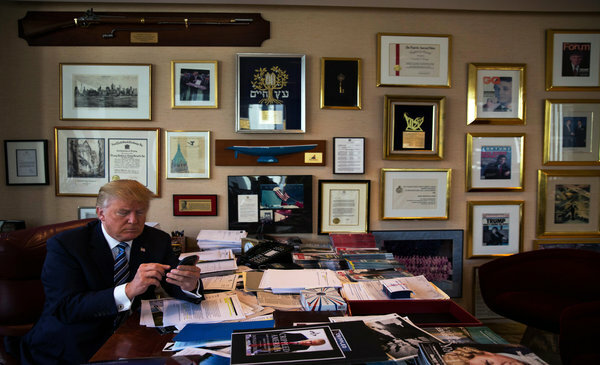 Can Donald Trump save Twitter? Donald Trump: A Modern Manchurian Candidate?